The Village of Airmont is being sued by a Satmar school and several dozen parents who say the municipalities’ actions have illegally used its zoning board to prevent them from meeting their community’s educational needs. Keisha Russell is the lead attorney for First Liberty Institute, a Texas-based religious liberty law firm that is co-representing the parents and Satmar (identified in the suit as UTA) together with the Albany firm of Whiteman, Osterman and Hanna. “UTA isn’t asking for anything special. They just want to be treated like everyone else and to operate their school in a way that they’re entitled to,” Mrs. Russell told Hamodia. 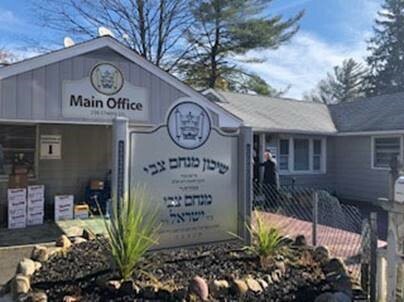 Airmont, which borders Monsey, has been home to several Orthodox schools, but only recently began to see a significant influx of residents from the community purchasing houses in the village. In 2016, UTA bought a 21-acre lot that had previously been used by another Orthodox school and day camp. Shortly after the purchase – when the fact that several hundred students were using the space and that two building plans were in the works to better suit their needs came to light – they encountered resistance from village officials who claimed that despite the size of the property, that only 167 students could use the area in keeping with a certificate of occupancy (CO). UTA claims the certificates relate only to specific buildings, not the whole area. They point to the fact that previous residents used the lot for over 400 students and campers at various times, a fact that must have been known to officials, since the property is directly across from the Village Hall. The suit also names the School District of neighboring Suffern as a defendant, claiming they have begun to deny transportation and some special education services to UTA students they serviced in the past, based on Airmont’s actions. “In a coordinated and concerted effort, [village officials] are engaged in yet another conspiracy to prevent Hasidic Jews from operating a private religious school to serve the educational needs of the surrounding Hasidic Jewish community,” says the suit. Mr. Mack emphasized that a 2001 Planning Board decision had approved the construction of two modular units to be used for no more than 167 students and that such a plan was never amended, adding that the present situation is a result of UTA’s admission that they were serving 300-400 students, in violation of the CO. Yet the suit details a long list of actions that it says the village has taken to block UTA from gaining permission to move ahead with its plans, and claims that the discrepancy in enforcement of Airmont’s laws is rooted in discrimination, aimed at discouraging more Orthodox Jews from moving to the area. The brief also says that the village’s attempt to revoke UTA’s tax exempt status based on the alleged non-compliance and a series of heavy fines constitute an attempt to hinder its operation. Airmont is no stranger to such accusations. The village’s founding in 1991, when it broke off from Ramapo, was widely seen as an attempt to change zoning laws especially relating to multi-family homes and houses of worship in a way that would make the area unattractive to Orthodox Jews. In the first 10 years of the village’s history, the federal Department of Justice served officials with two discrimination suits. Both were settled with an agreement that Airmont would not use zoning laws in a discriminatory manner. The agreement expired in 2011. Over the past decade, similar suits have become increasingly common in Rockland County and around the New York and New Jersey area, as many towns have attempted to use land use laws as a means to block the construction of eruvin, schools and shuls, in attempts to block Orthodox Jews from settling in their borders. “As Airmont officials should know by now, federal law prevents government officials from using discriminatory zoning schemes to drive people of faith away from, or underground in, the community,” said Hiram Sasser, General Counsel of First Liberty Institute.